LITTLE ROCK -- The University of Arkansas System Division of Agriculture honored a long-time advocate of agriculture on Monday, dedicating a boardroom to Ewell “Pete” Welch, former executive vice president of Arkansas Farm Bureau. The high-tech meeting room is located in the renovated annex of the University of Arkansas Cooperative Extension Service building on South University in Little Rock. Welch has spent his professional life in agriculture. He earned a bachelor’s in plant pathology and a minor in agricultural business. He also earned a master’s in agricultural economics -- both degrees coming from the University of Arkansas. His first job out of school was with the Arkansas Farm Bureau, which hired Welch to be part of its poultry division. He began work there in December 1977 and Welch never looked back, serving at Farm Bureau for 36 years. In 2002, he interviewed for the position of executive vice president -- a job he retired from in 2013. 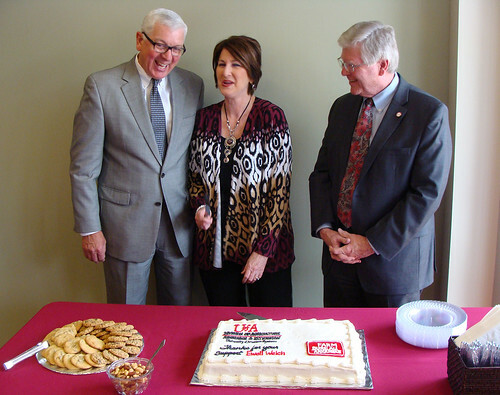 For more information about the Cooperative Extension Service and its programs, contact your county extension office or visit our newly renovated site, www.uaex.edu.